Deep joy - Boogizm make a long awaited return. This is S-max' first solo-artist ep on his own imprint, accompanied by his "resistance is futile ep" on over-x released about now, and as you'll already know if you've been following closely these last few years, this guy has the way with wicked twelves. This highly personal definition of future housey-detroity-minimal-whatever music is loaded with his unmistakeable good-trip-cartoon-style, armed with bleeps, bassline funk and bitcrush soul. Deep in the boogizm-space, we can range freely from moody outerworldliness to dancefloor bangers. After a smooth clicky intro, its followed by a banging, bending bassline in progress with swirling chords - a true mind expanding floorfiller. "Braincell harvester" is detroit-moody, digging deep - the flipside goes house at first, "down with the physical" is slow-motion disco, a non-conformist funk careering across the floor. The now customary interlude lands with hiphop-flava/ then "anarchy barbie" rolls down your spine slow and gentle, crunchy subsonics kick it while a solid groove wanders off then bounces back more forcefully then ever. 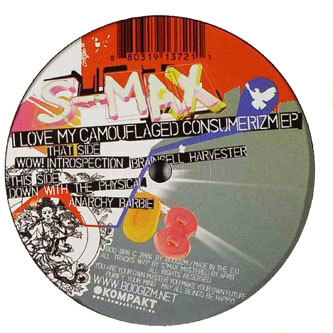 Further proof that club techno with soul is not yet an extinct artform- smashing as always, big up S-Max!